It is possible to closely integrate frePPLe’s user interface in other web applications. Ability to authenticate user with a web token (see https://jwt.io/introduction/) issued by another web application. Users only need to log in once. The user authentication is handled your web application, which forwards the credentials to frePPLe in a securely encrypted token. Ability to display frePPLe in a iframe, with or without its navigation bar. Below are two examples of such an integration. 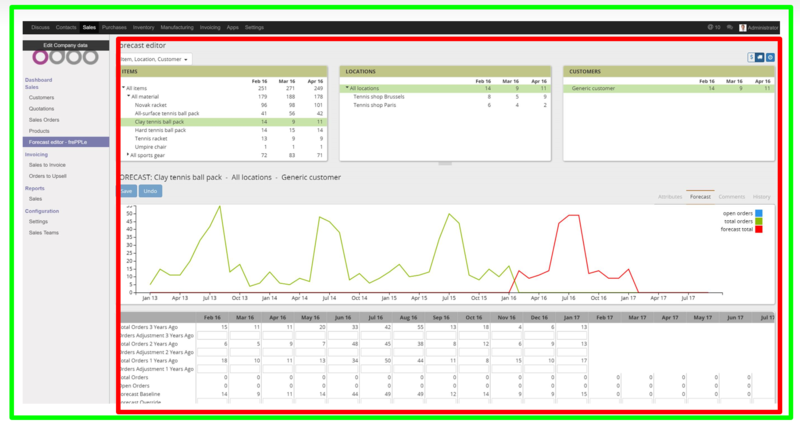 The green boundary is the complete user interface, in this case Odoo (see https://odoo.com) and skulocity (see http://skulocity.com). The content of the red area is generated by frePPLe. The user that is authenticated. The user must be defined in frePPLe and his/her role and permissions within frePPLe need to be defined: See below. The expiration time until which the token is valid, expressed as seconds since Jan 1st 1970 GMT. The site https://www.epochconverter.com/ provides a convenient check on these values. A token should normally be valid 1 to 2 hours after its generation. The navbar argument specifies whether frePPLe should render its navigation header or not. In most case you’ll want to hide it. Below is an example code snippet using the Python PyJWT library (see http://pyjwt.readthedocs.io/en/latest/). https://jwt.io/#libraries contains links to implementations of the JWT specification in many other programming languages. The external application needs to use an iframe to display frePPLe’s content. If your application is running under HTTPS, frePPLe will also need to be configured to use HTTPS. Otherwise browsers will refuse to display frePPLe’s unencrypted data on the page. On frePPLe’s side the shared secret needs to be configured in the file djangosettings.py. By default it is set to the secret key of the frePPLe application. It is more secure to generate a separate secret key for the web token authentication without sharing frePPLe’s own internal secret key.